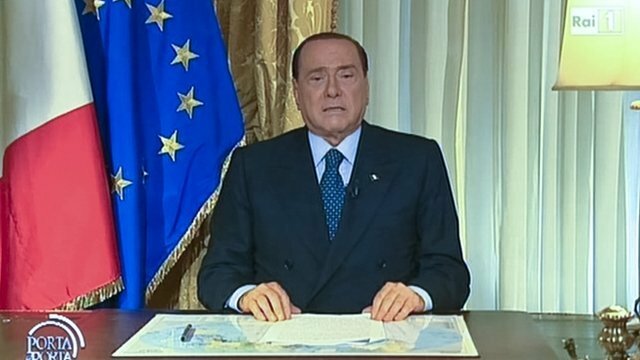 Silvio Berlusconi has broadcast an angry video message after his jail sentence for tax fraud was upheld by Rome’s Court of Cassation, the country’s highest court. Italy’s former PM Silvio Berlusconi said he was the innocent victim of “an incredible series of accusations and trials that had nothing to do with reality”. The court also ordered a further judicial review on whether Silvio Berlusconi should be banned from holding public office. Silvio Berlusconi, 76, is unlikely to go to jail because of his age. While he is expected to serve out his sentence as house arrest, Silvio Berlusconi has the option of asking to do community service instead, with the deadline for the application not expected to fall until mid-October. The ruling by Rome’s Court of Cassation, against which he cannot appeal, came after a three-day hearing. Silvio Berlusconi was not in court. In an emotional nine-minute video, Silvio Berlusconi denounced the decision as “based on nothing, and which deprives me of my freedom and political rights”. “No-one can understand the onslaught of real violence that has been directed against me following an incredible series of accusations and trials that don’t have any foundation in reality,” he said. He described the more that 50 court cases he has faced as “genuine judicial harassment that is unmatched in the civilized world”. It is the billionaire businessman’s first definitive conviction after decades of criminal prosecutions. Silvio Berlusconi was sentenced to four years in prison at the conclusion of the trial in October last year, though this was automatically reduced to a year under a 2006 pardon law. The review of the lower court’s five-year ban on holding public office means Silvio Berlusconi can remain as a senator and as leader of his centre-right People of Freedom Party (PDL) for now. Silvio Berlusconi’s political grouping forms part of Italy’s coalition government. Prime Minister Enrico Letta needs both the PDL and his own centre-left Democratic Party to govern. In a statement after the court ruling, Enrico Letta urged “a climate of serenity” for the good of the country. Silvio Berlusconi’s legal team said there were “solid reasons” why Berlusconi should have been acquitted, and it would “evaluate and pursue any useful initiative, also in Europe, to make sure that this unjust sentence is radically reformed”. In a statement on his blog, Beppe Grillo said Berlusconi had “polluted, corrupted and paralyzed Italian politics for 21 years”.